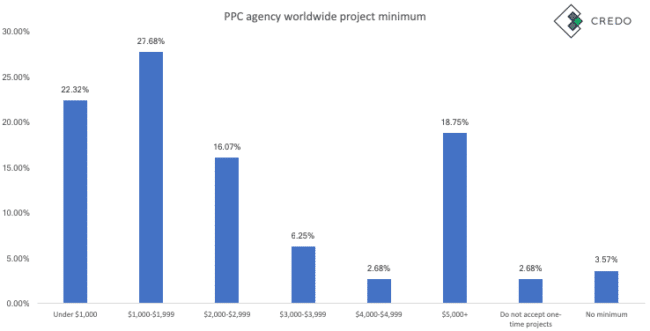 Every always asks us “how much does a PPC agency cost?”, to which we explain that it depends on many factors such as but not limited to their location, their size, the type of work they’re offering (services, strategy, or both), and how senior they are. We crunched the numbers that came back from our survey to find the answer for you to begin with though. The way to interpret this data is to remember that these are averages and a starting point for a conversation, but depending on how you pull the levers a firm will be more or less expensive. We have tried to slice and dice the data for you so that you can see how this happens on average. But once again, it will depend on the factors listed above. An agency based in New York City will usually cost more than an agency in Kalamazoo, Michigan simply because of the average price of talent. 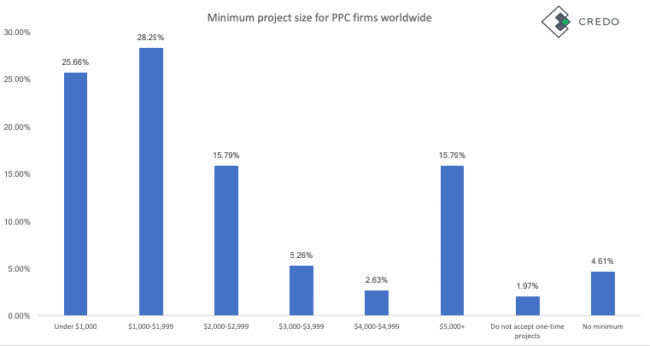 A quick caveat that we only noticed after putting together this section is that we did not specify in the survey whether this was client spend or the firm’s take from the project for project minimums and monthly retainers. So, the data for those sections should be viewed directionally. 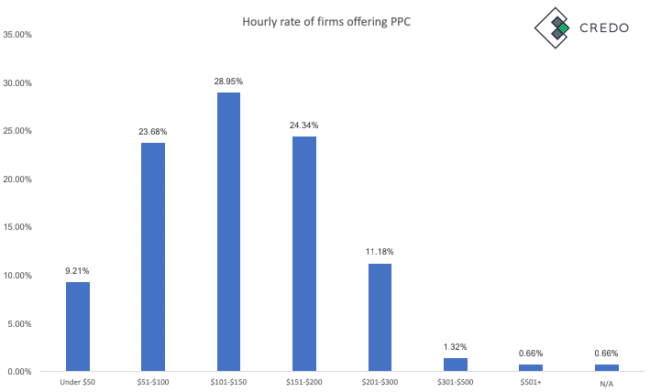 First let’s look at the average rates of PPC firms worldwide. As the company gets bigger, their single project minimums go up. 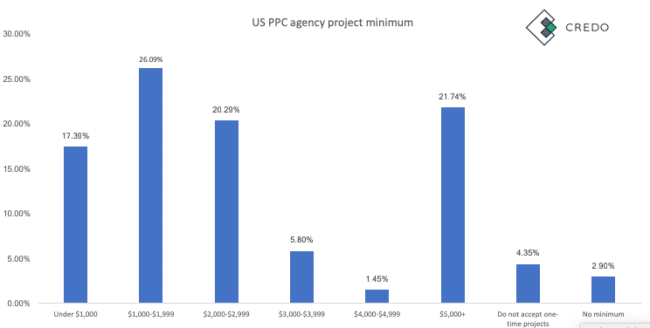 In fact, once a PPC firm gets above 5 their minimums are much more likely to be over $5,000. 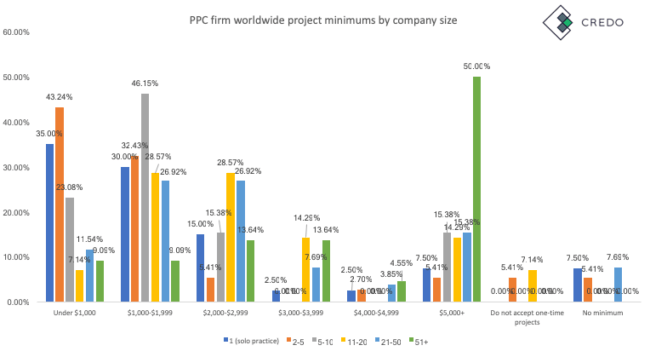 A full 53.95% of PPC firms worldwide take single projects under $2,000 in value. Only 1.97% of firms do not take one-time projects (eg audits). 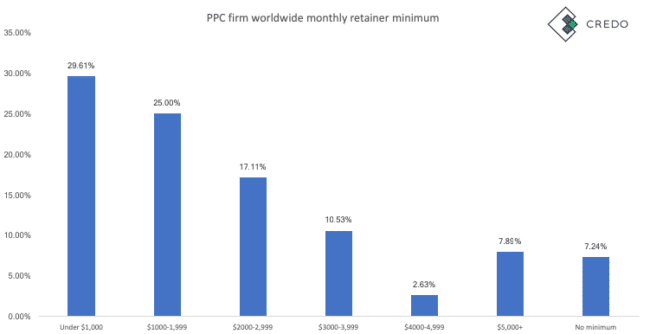 No PPC firms in our dataset with 20+ employees only do retainers. This is different from SEO. 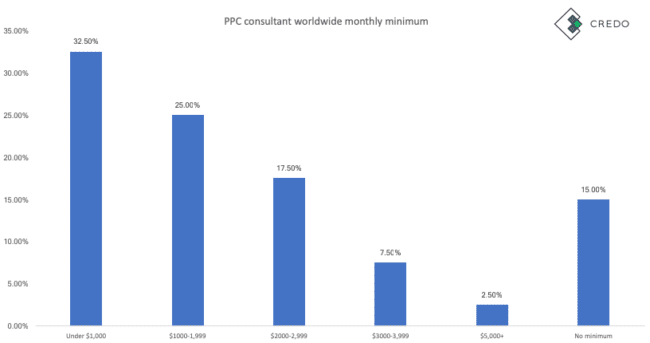 Only 10.52% of PPC firms worldwide have a monthly minimum above $4,000. 7.24% of firms say they have no minimum. 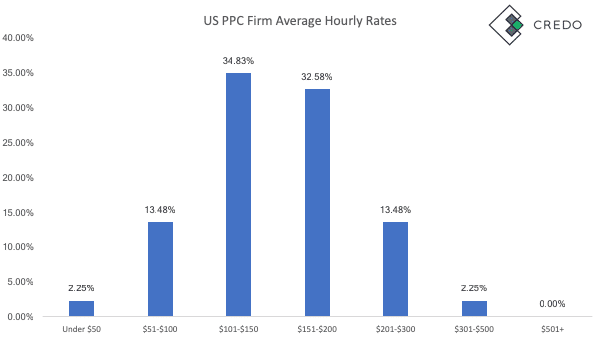 Here are the average rates for US and UK PPC firms. 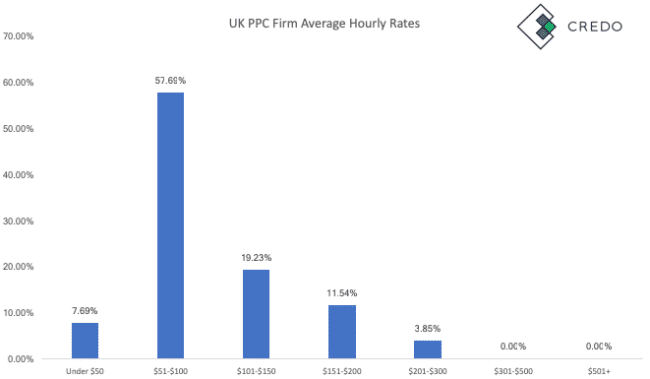 UK PPC firms need to charge more! 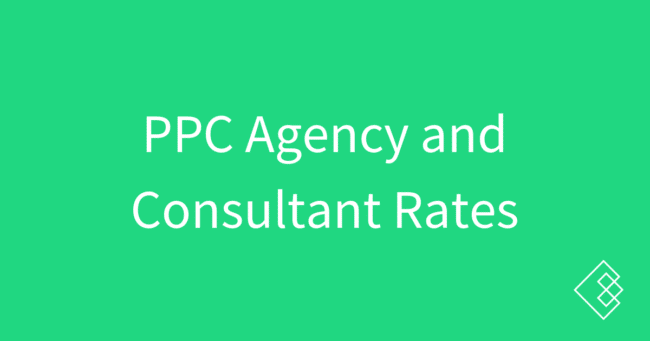 Now let’s look at average PPC agency rates. 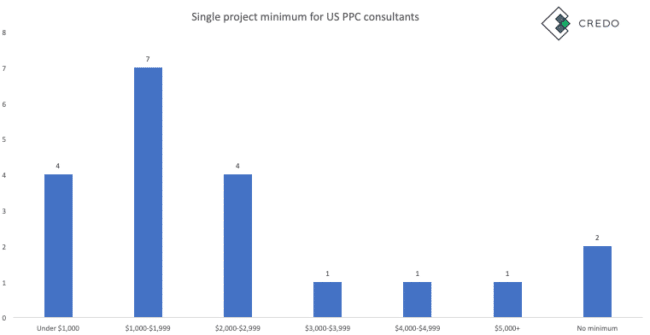 US PPC agencies are only nominally more picky in the project sizes they take. Still a very large number (43.48%) take projects under $2,000 and 17.38% take them under $1,000. 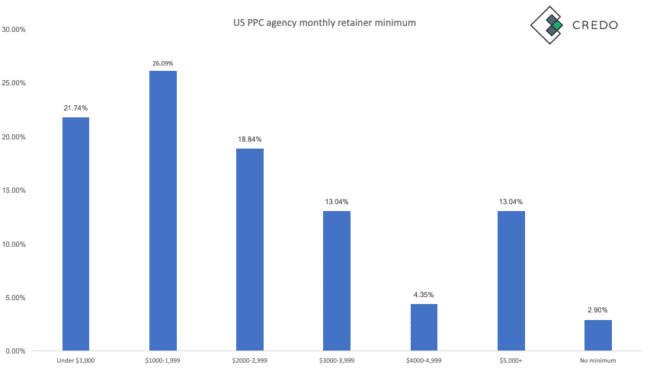 A full 13% of US PPC agencies have a monthly minimum over $5,000. This is higher than the worldwide average. 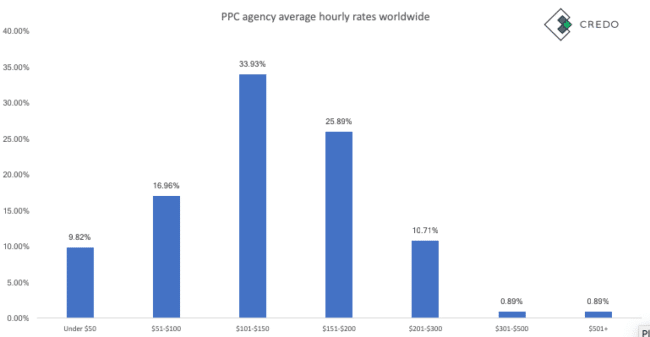 US PPC agencies are, from our data, more expensive than the worldwide averages. 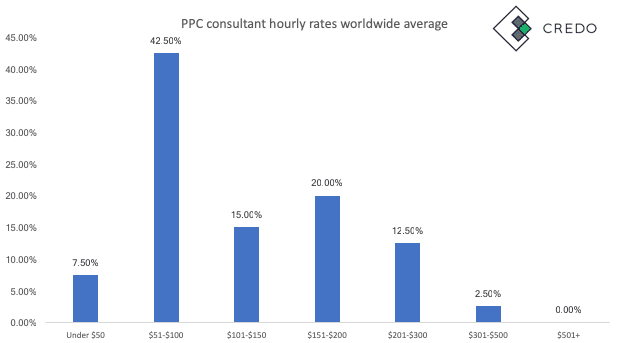 Now let’s look at PPC consultant rates worldwide and US specific.